This is part 2 of a 3-part series on how to achieve more with less in life using the 80/20 principle. If you are new to this series, read part 1 first. 80/20 means eliminating all unimportant tasks. Not true. Some tasks are low value but need to be done. For example, washing laundry, paying the bills. Not doing them will create a negative downside. The 80/20 rule is about spending more time on the important tasks, spending less time on the unimportant (by delegating, batching), and eliminating the tasks with almost no value (not doing them will not make a difference). It must be precisely 80/20. Not necessarily. As I mentioned in part 1, It just happened that Pareto’s observation was 80-20 (rather than 70-20). So let’s say you have 10 tasks on your to-do list. It doesn’t mean that there must be precisely 2 tasks (20% of the 10 tasks) with high value. Maybe you have 3 tasks that contribute to 80% of the value. Maybe 4 of the tasks contribute to 90% of the final impact. The point is that a small % of inputs lead to a large % of results. 80 must add with 20 to be 100. 80% represents the effects while 20% represents the causes. When Vilfredo Pareto made the connection, it was regarding the distribution of wealth in Italy, where 20% of people owned 80% of wealth. The reality is that it can be 70/20, 90/30, etc. The % of causes don’t have to add up with the % of effects to be 100. 80/20 is about being lazy. No — 80/20 is about being effective. 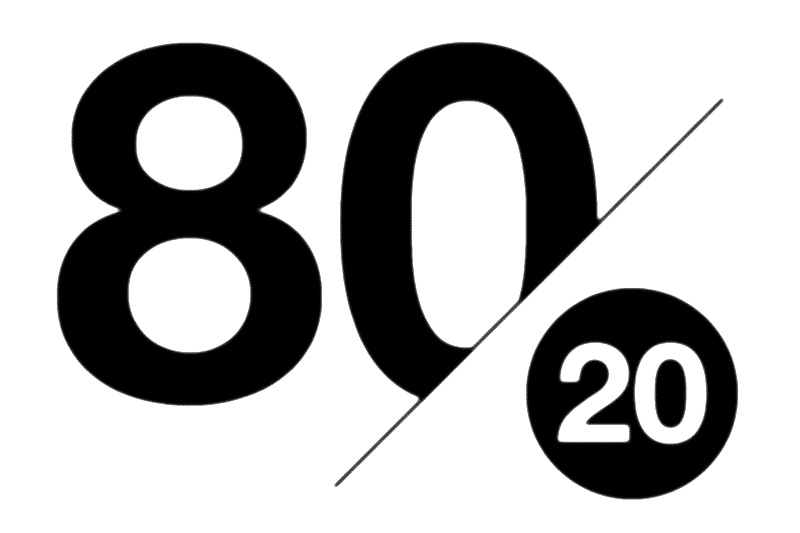 When you use the 80/20, you think about the areas where you can make the most impact so that you can focus on them. It’s about using your limited energy to create the maximum impact, rather than being haphazard and unstrategic in the way you do things. It only applies to business. While 80/20 gained popularity in the business world, it can be found in almost everything in life. It can be found in sports, science, software, medicine, and more. It can be found in our relationships, beliefs, goals, habits (20% of habits will make the biggest difference), and health (20% of actions will make biggest difference to our health). It’s really a way of life. 80/20 is about being mercenary. Some people may resist the 80/20 because they don’t want to choose. They are uncomfortable about saying no. They want to do everything. But when you don’t apply the 80/20, you are already choosing — you’re choosing against the high-impact tasks that could benefit enormously from your attention, focus. 80/20 is about choosing to make the most impact with your limited time on Earth. I used to write off the 80/20 principle because I felt it was at odds with my perfectionistic self. My belief was that we should give our 100% in everything, rather than picking things to focus on. I also felt that the end result in any activity comes from the sum of its inputs. If we were to cut away the parts that “do not matter as much,” the net result would suffer in ways we cannot anticipate. But these feelings came from linear thinking and not looking at things with a big picture. I later realized that I was looking at things in the wrong way, without regard of resource constraint. Sure, in a perfect world where I have unlimited time, energy, and infinite resources (money, etc.) at my disposal, then the 80/20 wouldn’t matter. If I could split into 100 bodies and be in 100 places at once, plus not sleep without detriment to my body, then I could focus on 100% of inputs with 100% dedication. Not strive to serve every customer (or reader), but to serve customers that appreciate what I do, that value my time, and that don’t take my work for granted. Knowing that I can remove the 0.01% toxic web visitors has freed up much of my mental energy to serve the 99.99%. For the idealist and perfectionist, the 80/20 principle is even more important because it helps us to achieve more and be more despite our limited time and energy. By prioritizing correctly and applying our energy to the right places, we get much more out of life. Like any law and principle, application by people means that perception and judgment will come into play. This means that we may make mistakes. We may select certain tasks as 20% high value when they aren’t. We may cut off certain low-value tasks that turn out to be crucial later. The best way is to tackle this is to improve our judgment. This can be done by learning. By making mistakes. By measuring our results and quantifying the link between input and output. By studying what the best people are doing so we can learn from them.